Boulder County, Colo. - Ron Stewart Preserve at Rabbit Mountain will be closed to the public Monday through Wednesday from Sept. 17, 2018, through Jan. 31, 2019, for year two of a three-year elk management program through limited hunting. If hunters are successful early in the week, the park will be reopened the following day. There will not be no hunting Dec. 20-30. The park will be open all days that week. Three hunters per week have been granted an access pass by Boulder County to hunt this specific area only during this management period. Each hunter was selected through a random drawing of CPW-licensed hunters who obtained the subunit antlerless license (hunt code E-F-020-L3-R) and who then declared interest in this program. Hunters were required to attend an orientation class and pass a shooting proficiency test. This hunting program is solely and specifically permitted as a resource management tool. There is no cost to the hunter beyond the existing Colorado Parks and Wildlife license system and Boulder County does not receive any revenue. Recreational hunting at Ron Stewart Preserve at Rabbit Mountain or any other open space property is strictly prohibited. 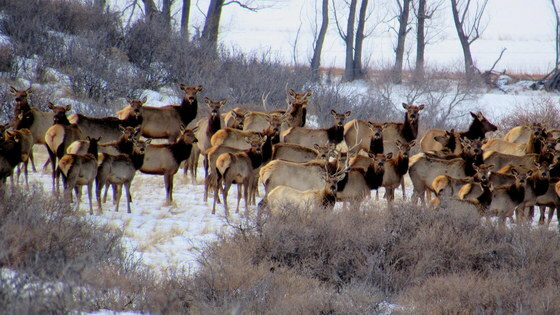 For more information about this program and the management goals at Ron Stewart Preserve, please visit www.BoulderCountyOpenSpace.org/elkmanagement or contact Jenny Dalton, Boulder County Parks & Open Space Elk Management Hunt Coordinator at jdalton@bouldercounty.org, or 323-420-8551.